Sterling silver and real Charoite. 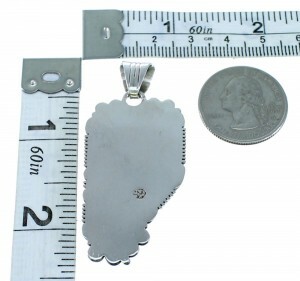 Pendant measures approximately 2-1/4" long (including bail) and 1" at widest point. You will absolutely fall in love with this stunning pendant! 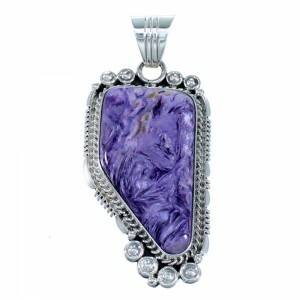 This piece of Native American jewelry is Navajo hand crafted by artist Daniel Benally, out of genuine sterling silver and a real Charoite stone. The stone is carefully placed in a hand cut bezel setting, while being highlighted with twisted silver, mini stamped silver beads, and hand cut silver work for an exquisite finish. The pendant is hallmarked. 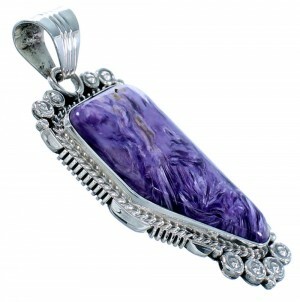 Charoite was discovered in Russia in 1978 in a mountain in Yakutia, near the Charo River. The beautiful stone has an array of color ranging from bright lavender, violet and lilac to dark purple with a combination of white, gray and black matrix. Its glorious purple color features a unique combination of swirls, feathers and needles. Charoite is believed to enhance confidence, accelerate spiritual growth, and increase the ability to love. Some people believe that Charoite got its name because of the impression that it gives "Chary" which in Russian means "charms" or "magic".